1) Right on the heels of What the Fork’s post on longtime East Oakland favorite Taco Grill’s across-the-street move (and name change, to Obelisco), Berkeleyside Nosh reports that the restaurant’s old spot in Fruitvale Public Market has a new tenant: The Half Orange (3340 E. 12th St., Ste. 11), a sausage-and-beer joint owned by Jay Porter and Katie Mayfield. Porter and Mayfield are the husband-and-wife team behind Salsipuedes, a Mexican restaurant that they’re opening in North Oakland. It sounds like The Half Orange, which is slated to open sometime this summer, will be an updated version of The Linkery, the now-shuttered sausage-centric (and tip-free) restaurant that Porter ran for many years in San Diego. 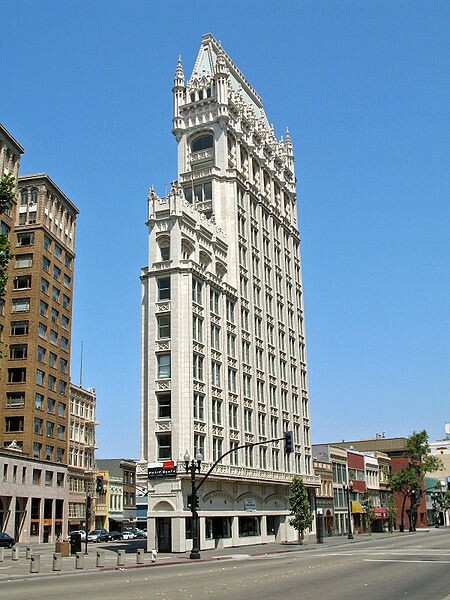 2) A new bar is coming to the first floor of Downtown Oakland’s historic Cathedral Building, Inside Scoop reports. Opened by two East Bay natives returning from stints in the New York City bar scene, The Cathedral Bar (1615 Broadway) will feature decor “inspired by the aesthetic of late ‘60s and early ‘70s lounges,” craft cocktails, and an upscale bar menu that will include things like empanadas and Italian paninis. Look for an opening date sometime around the end of the year. 3) In other booze news, Inside Scoop reports that two new microbreweries are on their way to the East Bay: First, Cleophus Quealy Beer Company, a brewery and tasting room that’s being built at 448 Hester Street in San Leandro, is the brainchild of a couple of former Google engineers with an interest in Belgian- and French-style beers. Meanwhile, Independent Brewing Company is a new microbrewery/taproom/beer garden project that’s coming to 444 Harrison Street in Oakland’s Jack London Square neighborhood, courtesy of a co-founder of Oakland Brewing Company. 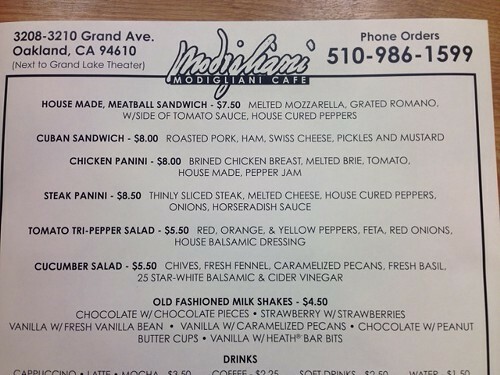 4) Berkeleyside Nosh notes the arrival of a new restaurant called Modigliani Cafe in the former Day of the Dead Coffee space (3208-3210 Grand Ave., Oakland) next to the Grand Lake Theater. Coincidentally, I passed by last Friday, on what appeared to be the restaurant’s first day of business, and took a peek at the menu. Comfort-food sandwiches (a meatball sub, a Cuban, and a couple of different paninis) and old-fashioned milkshakes ($4.50 a pop) appear to be the main focus. 5) Further down Grand Avenue, Barlago (550 Grand Ave.), an Italian restaurant and wine bar from the owner of the two Filippo’s restaurants (in Rockridge and Berkeley), recently opened in the former Zza space, East Bay Dish reports. 6) Just a few months after moving back to West Oakland, the Freedom Farmers’ Market has moved again, but this time, organizer Gail Myers says, the move is likely permanent: The affordably priced farmers’ market will now take place on Saturdays, from 10 a.m. to 3 p.m., at the Telegraph Community Center, at 5316 Telegraph Avenue. Since there’s a community garden on site, the market will host gardening workshops on Saturdays as well. What this means, too, is that — in an abundance of riches — residents of the Temescal neighborhood now have a farmers’ market to check out on both days of the weekend. 7) Sweet Bar (2355 Broadway), the Uptown Oakland bakery and cafe, has launched dinner service and will now stay open until 9 p.m. Tuesdays through Fridays, Inside Scoop reports. 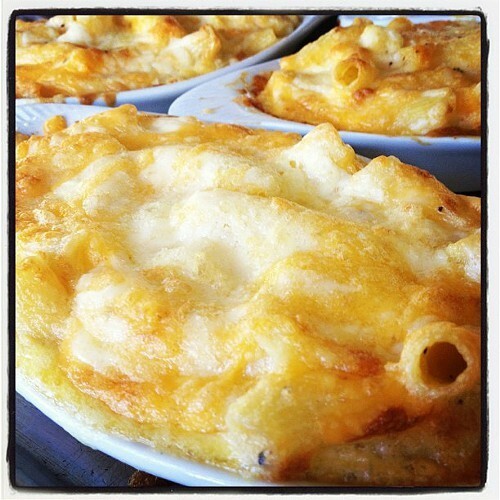 In addition to the regular cafe menu, there will be dinner specials like mac ’n’ cheese made with Baia pasta and chicken- and veggie-pot pie. 8) Edible East Bay offers a great look at an aspect of Oakland’s vaunted recent food renaissance that isn’t much reported: the people who are actually bankrolling the city’s splashiest new restaurants, whether they be big-time investors or local lending organizations. 10) Finally, ICYMI, Caviar is now offering delivery service for East Bay restaurants like A16 Rockridge and Hawker Fare, and Charlie Hallowell is kicking off a philanthropic-minded Sunday Suppers series this weekend.